Colourful, full of culture, history and an ethnic mix of French, Arabic and North African, Morocco is a melting point of exotic influences. Said to have been inhabited since the Paleolithic era between the years 190,000 BC and 90,000 BC, Morocco has been home to Romans, Visigoths, Vandals and Byzantines and was a protectorate of France and Spain, before gaining independence in 1956. Located in the northernmost region of the African continent, Morocco’s proximity to Europe makes it an attractive year-round destination and one that’s easily tagged onto trips to nearby neighbours, Portugal and Spain. A country that’s as diverse as its landscape – from mountains, red sandy deserts and lush green hills – it’s a destination that will awe and confound at the same time. Knowing a few words in Arabic will help. However Morocco’s official languages are Arabic and Berber, and as former French and Spanish protectorates, communicating in French will prove equally useful. If you’re visiting Chefchaouen (former Spanish Morocco), the locals will understand Spanish. It’s a Muslim country but unless you’re entering a holy site, women are free to leave their hair exposed. Regardless, a modest dress code is preferred, so keep shoulders and knees covered. While the shopkeepers at the medina can be enthusiastic salespeople, you’re not obliged to buy just because you’ve stepped in to have a look. However, a small tip is always appreciated upon leaving and try not to start the bargaining process unless you have a semi-serious intention to purchase. It’s not. Bargaining is part of the game and prices are deliberately set high for haggling to take place. Don’t feel bad about cutting the price down to 50% as it’s likely closer to its actual value. If you’re unsure how much to pay, ask your hotel/riad staff for a rough estimate or tips beforehand. If you’ve stepped into a store where prices are prominently displayed, take it as a hint that no bargaining will be entertained. Taking snapshots of snake charmers and camels make for great memories but keep in mind that this is also someone’s livelihood. If you want a photographic keepsake, be courteous by asking and offer a small tip in return. Unfortunately, unless you’re Muslim you will not be permitted to enter. That said, viewing the mosque from the outside is allowed and watching prayer-goers enter and exit during prayer time is always interesting. One exception though is the Hassan II Mosque in Casablanca where non-muslims are allowed to enter. Not all taxis have a metre (or will use one) so it’s best to have a rough idea of prices and/or agree on one before stepping into the taxi. Also, just because you’ve bargained a price doesn’t mean you should avoid tipping, rounding up the fare will suffice. Downloading an offline Google Map is never a bad idea but it may not be sufficient to navigate certain parts of Morocco, especially inside the medinas which can be a maze. Fes’ medina, alone, is said to have 9,000 streets and 40,000 dead ends. It’s good practice to collect a map from your hotel and to mark down its location. Also, do some research and have a rough idea of what you want to see/buy or, employ the services of a pre-arranged licensed guide. If you do venture out on your own and find yourself lost, ask for help from a local business and do tip them for their assistance. It is warm year round but it’s also a big country and temperatures can vary depending on where you are. If you’ve got a desert trip in mind, bring something warm as once night falls it will get cold. Also, if you’re visiting outside of the summer season, a light jacket or scarf will always come in handy for the evenings. Unless you’re planning on being in the car for the majority of the time you won’t see much. Driving from Marrakech to Ouarzazate (the gateway to the Sahara Desert) can take anywhere from 3.5-4 hours depending on traffic and road conditions. So either plan to be in the country for longer or, pick and choose your desired destinations carefully. 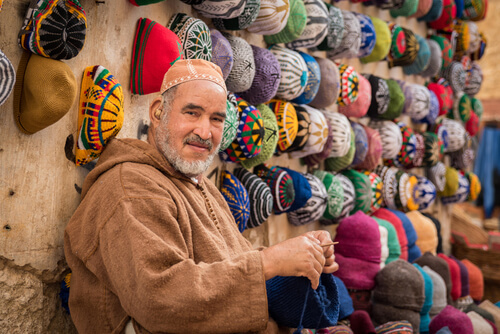 While credit cards are accepted at bigger stores, hotels and restaurants, this is a cash-friendly country especially if you’re picking up souvenirs from the souk. Having dirhams will come in handy especially when it comes to tipping. Keep in mind it’s a closed currency – you’ll only be able to obtain dirhams when you’re there. Stick to Euros, US dollars and Pound sterling, which are the most accepted currencies. Also, budget accordingly as whatever you don’t spend cannot be exchanged once you leave Morocco. It is safer to drink bottled water but many hotels also offer filtered water for guests, which will be properly sanitised. A good idea is to bring along a filtered water bottle to carry around which will help you stay hydrated, especially if you’re taking a trip to the desert. 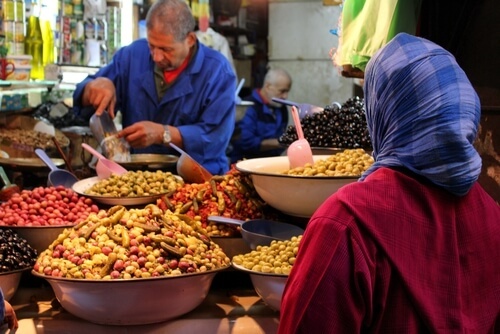 As taxes of between 7-14% are already added for goods and services, the tipping culture in Morocco is not formalised. However, it is expected to tip for services rendered, whether it’s a luggage porter, navigation help, or photo taking. The expected tip for any meal or drink is 10%, for small services this can range from MAD5-10 (.70c-AU$1.40) and between MAD10-20 (AU$1.40-AU$2.90) for services like pumping petrol or transportation. Not everything is shut so like anything, it’s best to check ahead. While some places in Marrakech will close for Friday midday prayers, they’ll open after prayers are concluded. You’ll find that supermarkets, banks, hotels and even some shops in the medina will remain open as per usual. The exception is Fes where most of the souk and cafes will be closed on Friday. Contrary to what you might think, alcohol is sold in Morocco, however, it won’t be available in public places, and definitely not in the medina. Hotels and restaurants will be the best places to have a drink, however, some supermarkets like Acima and Marjan will sell alcohol like local beer and wine. The rules to remember are simple: don’t drink near a mosque and it’s better to partake in private.